Travel into another world with 'holy faith' ! ... This pendant is entirely hand fabricated from solid fine and sterling silver. Nestled in a fine silver bezel setting at its center is an 26 mm x 36 mm cabochon Crysocolla gemstone. The Crysocolla Gem is accentuated by ripples, swirls and balls of solid sterling silver.The 'Sante Fe' pendant bears a total weight of 22.5 grams and measures 55 mm x 37 mm. 'Sante Fe' Pendant $ 229. 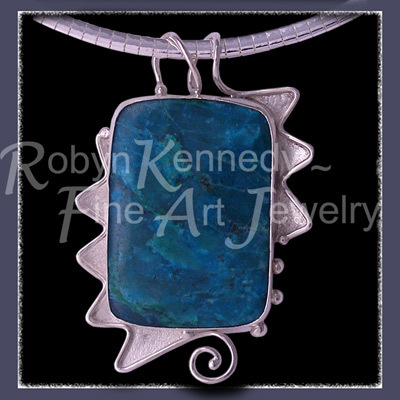 If you would like to commission a 'Sante Fe' Pendant of your own ... please contact us by e-mail or phone at Rubyblue Jewelry. All of the jewelry showcased in the 'one-of-a-kind' collection are artist originals. To purchase the 'Sante Fe' Crysocolla Pendant without using PayPal, please contact us by e-mail or phone at Rubyblue Jewellery. If a design style or concept appeals to you but you would prefer to explore your own approach, please contact us at Rubyblue Jewellery. * Please note : All of the prices quoted are subject to availability and may on any given day, be adjusted to reflect fluctuations in the gold commodities market. * The displayed images do not necessarily portray the actual size of the jewellery.